Producers of perfect CTC TeaA fresh and clean look is all that you need. Bhatkawa Tea Estate is located by the Torsa River, in the Dooars region of West Bengal. Teas from this region are known for the combination of strength, character and brightness, the perfect CTC tea. Our tea is hand-picked and packed within days to ensure it reaches you fresh, brimming with flavour and natural antioxidants. 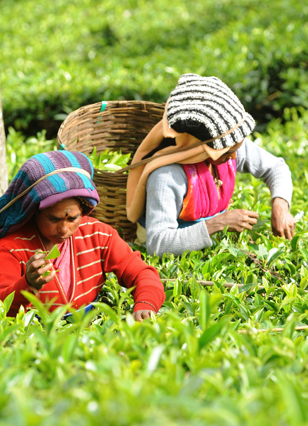 We are members of the Trustea initiative in India, a multi-stakeholder initiative led by the Tea Board of India, to sustainably transform the Indian tea industry. Our ethical sourcing experience has shown to us that a lot of progress can be made even with difficult problems. The best way to do this is by talking to and working with others. We involve other partners who bring different expertise, viewpoints and past experiences on similar issues in different sectors. The secret is not to re-invent the wheel, but to make the best use of our time and resources by tapping into the knowledge and experience that others have already developed. In our case, we work together with other tea producers. We work with unions, certification schemes (such as Trustea), governmental agencies and non-governmental organisations to ﬁnd sustainable solutions. BTIL was incorporated on 17th November, 1911 under the cCompanies Act, 1882 with the main objective of carrying business of tea which include inter-alia cultivation, manufacturing and selling of tea.BTIL owns and manages Bhatkawa Tea Estate situated in Dooars region of West Bengal. Total Grant area is 783.47 hectares and produces about 1.5 million kgs od CTC tea. © 2017 Bhatkawa Tea Industries Limited . All Rights Reserved | Design by: Xi Tech Solutions Pvt. Ltd.